How does income tax withholding work? Do I have to pay quarterly estimated taxes? What tax deductions and credits can I qualify for? How can I e-file my tax return online? How can I check my tax refund status? What are the penalties for failing to file or pay? How are state income taxes calculated? How does the U.S. income tax compare to other countries? The Federal Income Tax applies to most types of wage, investment, and self-employment income earned by all citizens or residents of the United States. If your income is over a certain threshold based on your age and filing type, you are required by law to file an income tax return (even if you don’t pay any income tax). Even if you don’t legally have to file an income tax return, you may want to file a return anyway to get withheld income refunded or to claim refundable tax credits. All individuals with income over the threshold must legally file an income tax return, or risk paying penalties and interest. If you work a normal job and receive a regular paycheck, chances are your paychecks are subject to income tax withholding. Income tax withholding is the percentage of your income that is withheld by your employer from each paycheck and sent to the IRS to cover Federal Income Tax and payroll taxes. All of the money witheld from your paycheck is credited against your tax account by the IRS. When you file your tax return on April 15th, the amount of income tax you owe will be compared to the total amount of money you have already paid through tax withholding over the course of the tax year. If your tax withholding exceeds the amount of tax you owe, the IRS will send you the difference as an income tax refund. If you have not paid enough through withholding alone, you will have to pay the difference when you mail or e-file your tax return. You can change the amount of each paycheck that is withheld by modifying your W4, which is on file with your employer’s Human Resources department. While paying to little through tax withholding could result in IRS fines, there is no advantage to pay too much in tax withholding – this only results in a large tax refund at the end of the year. If you are self employed or earn money through methods not subject to tax withholding (like investments or jobs that pay in cash), you may have to pay quarterly estimated tax payments to the IRS. As a rule of thumb, if you have to pay over $1,000 to the IRS when you file your tax return you haven’t had enough tax withheld and must make quarterly tax payments. If you have a variable yearly income, you should have at least 100% of your last year’s tax bill – or 90% of this year’s expected tax bill – withheld or paid through quarterly tax payments. Failing to make quarterly payments, if you are required to do so, can cost you in IRS penalties and interest – so make sure to make your payments on time. For more information on quarterly taxes, see How To Pay Estimated Taxes. Tax deductions and tax credits are two of the most common ways of reducing your income tax liability. Tax deductions are expenses you can deduct from your total income before calculating your taxable income, while tax credits are credits that can be deducted directly from the amount of tax you owe. Deductions: All Americans can claim the Standard Deduction on their tax return, which varies based on your filing status (but is approximately $6,000). Everyone is also entitled to one Personal Exemption for each dependent, including themselves, a spouse, and children. You also have to option to itemize deductions instead of claiming the Standard Deduction – this allows you to deduct expenses including mortgage interest, property tax, and certain medical expenses. Generally, you should only itemize if your total itemized deductions add up to more then your Standard Deduction. Credits: Popular tax credits for lower-income taxpayers include the Earned Income Tax Credit (EITC) and the Child and Dependent Care Credit. Students can claim the American Opportunity Tax Credit and/or the Lifetime Learning Credit, which can help offset tuition costs. Other popular credits include the Retirement Contribution Credit for qualified retirement savings accounts, and the First Time Homebuyer Credit for taxpayers purchasing their first home. E-filing your tax return is the quickest and easiest way to submit your forms to the IRS. The easiest ways to e-file are by using income tax software like TurboTax or by using a paid tax preparer. Lower and middle-income taxpayers can often get basic tax software at no charge through the IRS’s FreeFile Alliance program. Premium tax software costs between $35 and $100, and professional tax preparers can cost more then $150. For more information about the different methods of e-filing your federal and state income tax returns, see How To E-File Your Tax Return. If you e-filed your tax return, you can expect to get your refund direct deposited into your bank account in 10-21 days. Refunds for mailed returns can take up to two months to process. Once your tax return has been received, you can check the status of your refund through the IRS’s automated systems. 72 hours after e-filing, or 4 weeks after mailing your return, you can check your refund status by calling the IRS Refund Hotline at 1-800â€“829â€“1954 or by logging onto the Where’s My Refund tool on IRS.gov. For more details, see Requesting Your Income Tax Refund. The failure-to-file penalty is very steep, and the IRS recommends that you file a tax return (or request an extension) even if you cannot pay your full tax debt by the due date. If you can prove that you did not file or pay due to reasonable cause, the IRS may agree to waive your interest and penalties. An IRS Audit is a double-check of your tax return by IRS agents, which may result in changes to your return and the amount of tax you owe. IRS audits are often triggered by automated algorithms filtering for returns with abnormal combinations of deductions or tax credits, or the discovery of unreported income (like a 1099 that was not listed on your tax return). The IRS will notify you of an audit by telephone or through the mail. Audits may be completely through the mail, but more often will involve you (or your representative) meeting with an IRS agent at the IRS Headquarters, a field office, or in your home. The IRS will propose changes to your tax return, and you have the right to agree, or to disagree and present supporting evidence through an appeal. Generally, you can be audited on any of your last three years’ worth of tax returns. The statute of limitations for major errors can be extended to up to six years of tax returns. Of the 41 states that collect a general income tax, most collect a progressive income tax based on marginal tax brackets just like the Federal Income Tax. Several states collect a flat (regressive) income tax instead of using tax brackets. To simplify calculation, states often allow you re-use many aspects of your federal tax return on your state return – including your AGI, qualifications for popular tax credits, and itemized deductions. However, states often have unique standard deductions, personal exemptions, and tax credits. You will need to fill out your state tax return separately from your federal tax return, and ensure that you’ve adjusted your deductions and credits to reflect your state’s individual tax laws. For more information, you can compare state income taxes and find out more about your state in our section Income Tax By State. Compared to most other first-world countries, the United States has a relatively low personal income tax burden. Many European countries have maximum tax brackets of 50% or more, not including social security or other payroll taxes. The United States’ top tax bracket of 35% is among the lowest for developed countries. 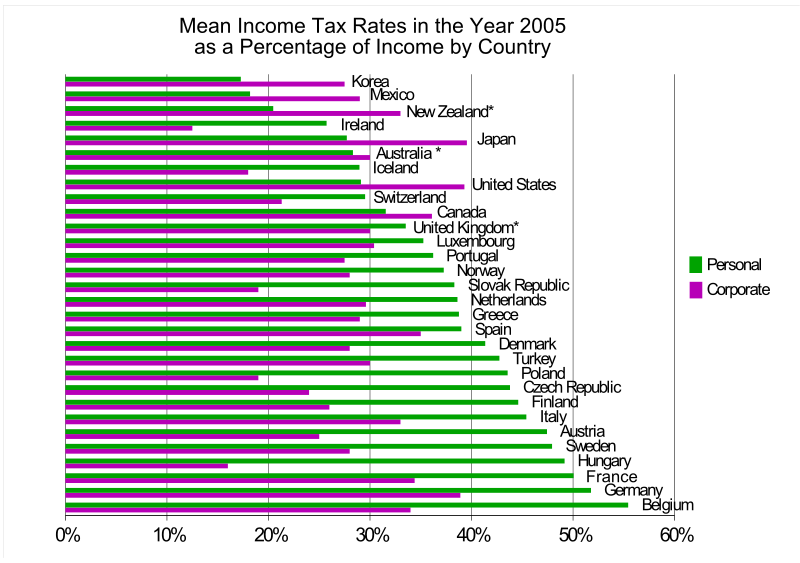 In business income taxes, however, the United States lags behind a good percentage of the developed world. The chart below shows how the the United States ranks among 30 of the top first-world countries in personal and business income taxes.